The new energy in Europe is green! New record for renewable energy in Europe: in 2016 we reach touches almost 90% in the new energy produced in the continent. Good news: last year almost 90% of the new energy in Europe has come from wind. 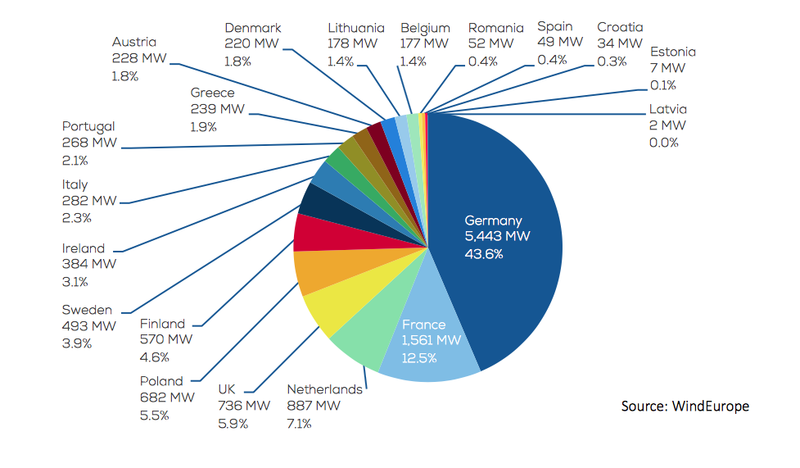 Specifically, 86% of the new power produced in Europe comes from renewable sources, especially from wind. 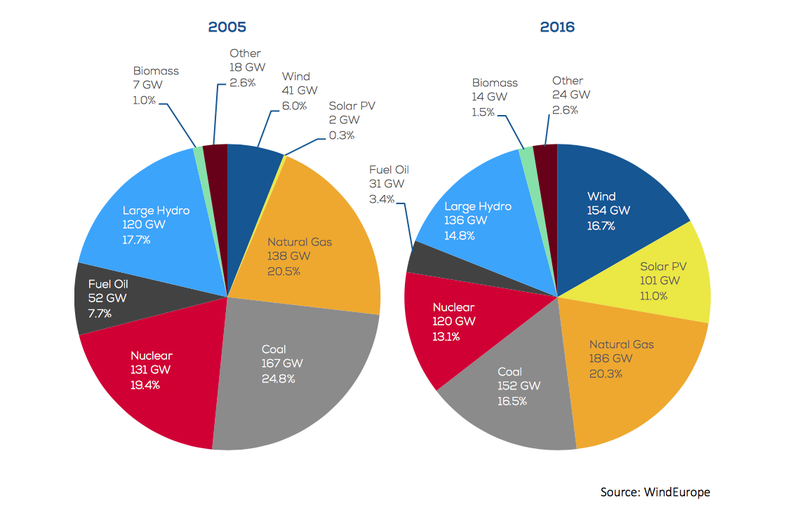 According to the latest Wind Europe dossier, wind power has overtakes coal as the the second largest form of power generation capacity. And so now the wind produce 153.7 GW. EU market shares for new wind energy capacity installed during 2016. Total 12,490 MW. Source: WindEurope. There is consequently a continuous improvement: if the 24.5 GW of new capacity installed in the EU in 2016, 21,1GW – then 86% – has been produced from wind, solar, biomass and hydroelectric power, in 2015 there we stopped at 79%. Share in installed capacity in 2005 and 2016. Source: WindEurope. Clean Energy: what are the most virtuous countries in Europe? But what are the most virtuous countries, that produce more clean energy? 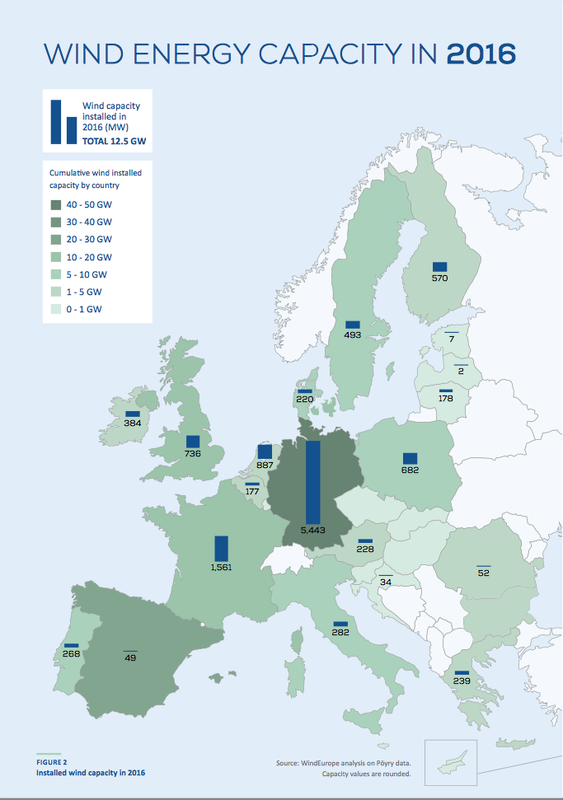 Germany installed in the last 12 months the highest number of facilities covering 44% of the total capacity of the EU. Spain, the United Kingdom and France follow with great numbers. The latter, together with the Netherlands, Finland, Ireland and Lithuania has also achieved in 2016 a new record for installations of wind farms. Wind Energy Capacity in 2016 in Europe. Source: WindEurope. Among the most important projects in the wind sector in the past year, it is worth remembering the Gemini Project, the Netherlands, which is the largest offshore wind farm ever funded. It was connected on February of last year and has an output of 2.6 TWh of electricity annually, supplying clean energy to about a million and a half people. Even in the world of tourism, we can see a growth in renewable energy investments: there are more and more hotels, bed & breakfast, farmhouses and mountain shelters that choose to use energy from clean, renewable sources, producing it on-site or by purchasing it. On Ecobnb it is easy to find and book these hospitality, just look for the destination of your travel and then select on the left (category Ecosustainability) 100% renewable energy to filter your results. 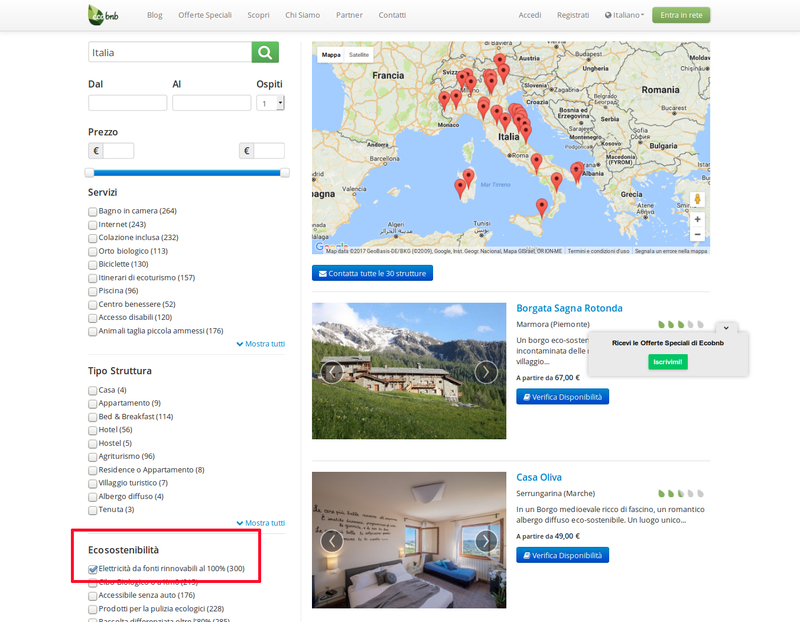 Map of Eco-Hotels that are using clean energy in Italy, doing a search for “Eco-Sustainability” criteria with Ecobnb platform. This entry was posted in curiosity and tagged energy, Europe, good news, Green energy. Bookmark the permalink.